While the former duo of ESPN’s Adrian Wojnarowski and Yahoo Sports’ Shams Charania have gotten more NBA scoops than a Coldstone Creamery, there is yet another scoopmaster operating in the interweb, providing breaking news days before the two lauded insiders did for their own networks. Reddit user SEAinLA had Kevin Love’s four-year, $120 million extension a week ahead of when the news broke nationally, a similar thing happened when the Philadelphia 76ers extended big man Joel Embiid, and again when the Milwaukee Bucks hired their new head coach Mike Budenholzer, and one more time when Marcus Smart signed his much-awaited extension with the Boston Celtics. SEAinLA had been breaking news before Woj and Shams got to them, which caught the attention of r/NBA, causing them to make an exception in their policy of no breaking news without a source, since he had proven ultimately reliable. While the Redditor has been right with each of his gut instincts to post these scoops, he shared what makes him different than the pro insiders doing so. “The difference between me and them is that their livelihood is at stake,” SEAinLA said, choosing to remain anonymous, according to Owen Phillips of Deadspin. SEAinLA works as an attorney, a very different line of work than that of a reporter — claiming most of his connections go back decades ago, just by knowing friends in high places that somehow ended up in the industry. 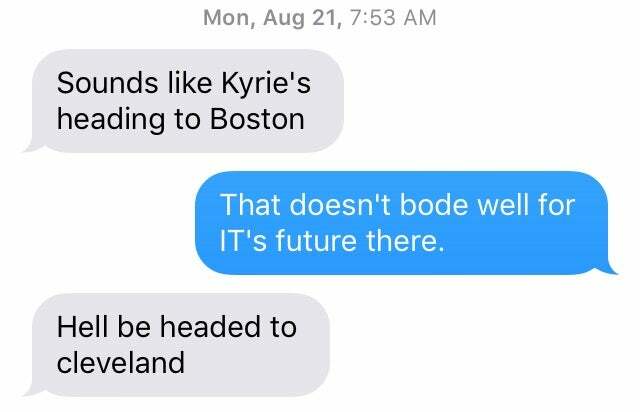 Such friendships allowed for texts as succulent as this one, detailing how Kyrie Irving would land in Bean Town after requesting a trade from the Cleveland Cavaliers. SEAinLA won’t post scoops on Reddit without his friends’ consent, but noted that he won’t try to convert into a different career or bet money on this information, claiming there is too much at risk. “Even if I think I know something is 100 percent likely to happen, I don’t want to risk money on second- or third-hand info being wrong,” he said. Journalists will double and at times triple-check their information before breaking news in hopes to cover their basis and do their due diligence, as customary. An anonymous presence in the internet faces no legal or real-life consequences for errant information, which has allowed SEAinLA to jump the gun and trust his instinct when posting on r/NBA and its affiliate team subreddits.